Will You Have a Yam? Dr. Haddon has kindly given me this unpublished Torres Straits catch. The native name is Lewer = Food. 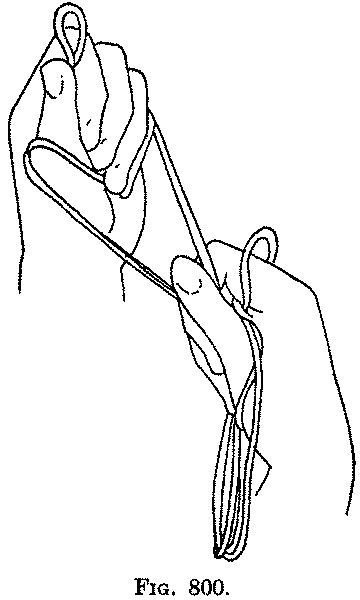 Second: Pass each index away from you over the little finger string and to the far side of it, then draw the string toward you in the bend of the index (Fig. 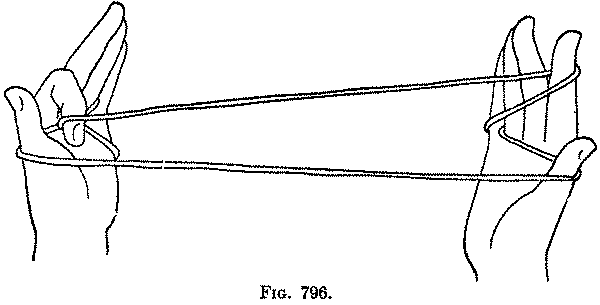 796, Left hand); turn the index up toward you in its usual position, thus turning the string around the tip of the finger (Fig. 796, Right hand). Third: Pass each thumb away from you under the far index string, and pick up from below on the back of the thumb the near index string (Fig. 797, Left hand), which crosses the palm obliquely, and return the thumb under the near thumb string to its position (Fig. 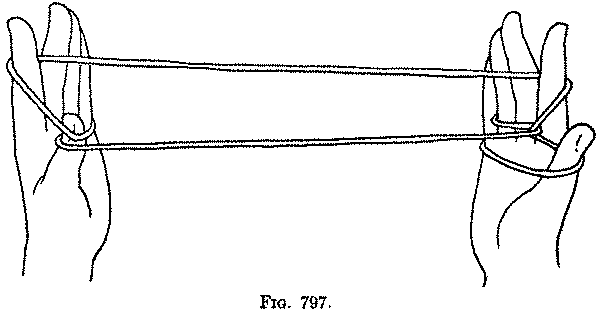 797, Right hand). Fourth: Pass each little finger toward you over the far index string, and pick up from below on the back of the little finger the near string, which passes directly from hand to hand (Fig. 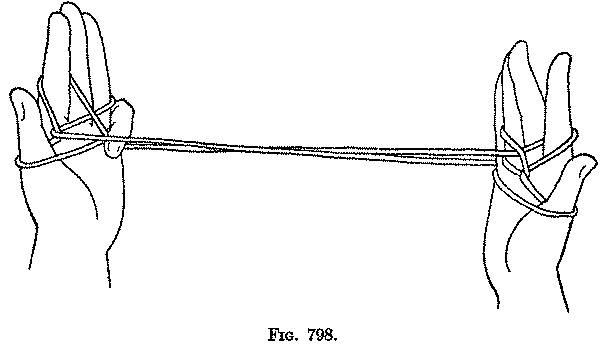 798, Left hand), and return the little finger to its position (Fig. 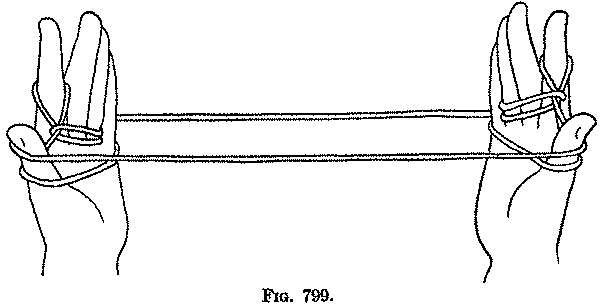 798, Right hand). Fifth: Pass each thumb away from you, and pick up, from below, the near string of the figure, and return the thumb to its position (Fig. 799). Sixth: Release the loop from the left index and hold it erect between the left index and thumb (Fig. 800). This loop represents a Yam. Offer this hand to another person: He says, "Have you any food for me?" You say, "I haven't any," pulling the right hand strings at the same time; the "Yam" disappears and all the strings come off the left hand. The same can then be repeated with the right hand.